23 year old Brenda Leticia (aka Leti) looks forward to Thursdays. On those mornings she makes her way to the school to collect wheat berries that have been used to make breakfast tea for the children. The berries will become feed for the hundred or so chickens that supply eggs to the SMF nutrition program, One Egg A Day. As the first paid employee of San Marcos Foundation, Leti tends the chickens, collecting eggs and conducting general coop maintenance. Having her own source of income is an exciting accomplishment for Leti! This is a first step in Leti gaining financial independence AND it allows her to help with family expenses for her parents and siblings, totaling 10, all living under one roof. Leti is the first of many women San Marcos Foundation hopes to empower through social, financial and skill-based opportunities at the hen farm. 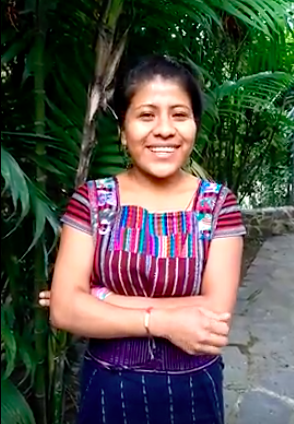 You can help empower women like Leti while she nourishes the students of San Marcos la Laguna. Donate today to transform their future! Previous Previous post: Thank you, from Maria!